A motley crew of retired police officers re-opens troublesome cases that were never laid to rest. From the discovery of a new motive in the killing of a college lecturer, to the tracing of a missing child, the team finds a way through the detail that eluded the original officers. But they are finding a surprising incidence of cover-up and conspiracy in their new investigations. Are their superiors about to close ranks? Or is someone feeding them particular files? Either way, the suspicion that they are being manipulated is high - and the team is determined to get to the bottom of it. These old dogs won't roll over too easily. 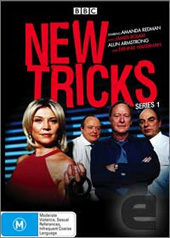 With awesome acting from Amanda Redman, James Bolan, Dennis Waterman and Alun Armstrong, this series comes together perfectly with comedy, drama and some of the most interesting storylines on this side of the Thames. With over 386 minutes, there's no reason why you shouldn't pick this series up! Check it out! When it comes to special features, this disc is unfortunately missing them severely and the series only includes the first 80-minute pilot as a special feature. What a shame! The video quality and sound quality of this series is above average, once again thanks to the folks at BBC who seem to do remarkable things were quality made television shows! In conclusion, if you're up for some light entertainment with some superb acting than you better check this series out, provided you're a fan of British TV!